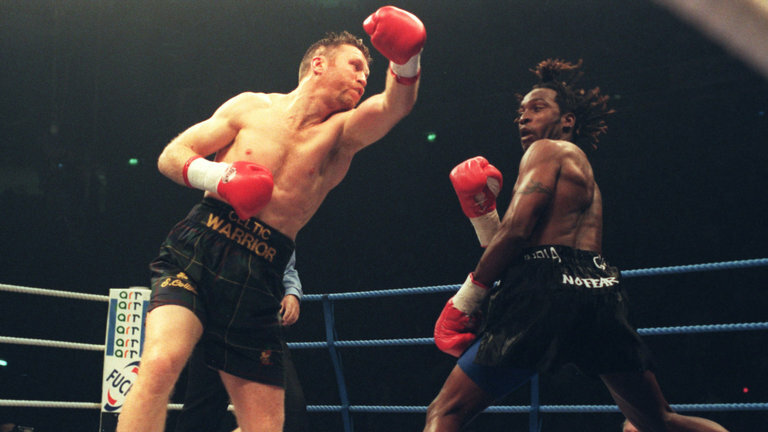 Nigel Benn and Steve Collins have agreed to a stunning fight – even though neither man has fought since the 1996 and both are over 50. Benn, 53, and Collins, 52, were once among the biggest names in the super-middleweight division. Dublin-born Collins has twice beaten Londoner Benn, who retired after their second fight in 1996. Details of the showdown have yet to be agreed but Benn expects it to take place in October or November. Benn, popularly known as ‘The Dark Destroyer’, held the WBO middleweight title and the WBC super-middleweight belt before retiring as a fighter following his second defeat by Collins at the Manchester Arena in November 1996. Speaking to the BBC, the Dark Destroyer said: “It’s about the final chapter. It’s about closure. “I was going backwards and forwards with Chris [Eubank] and I thought, ‘I wouldn’t have a problem with Steve’. So I asked him if he wants to fight. Collins, who ended Eubank’s unbeaten record to win the WBO super-middleweight title in 1995, last fought in July 1997. An attempt to come out of retirement in 1999 was halted when he collapsed during a sparring session. The Irishman has also talked of fighting again in recent years, saying in a 2013 interview that he wanted to take on Roy Jones Jr.
“It’s just about money, a payday which will allow me to buy some more land,” he said.